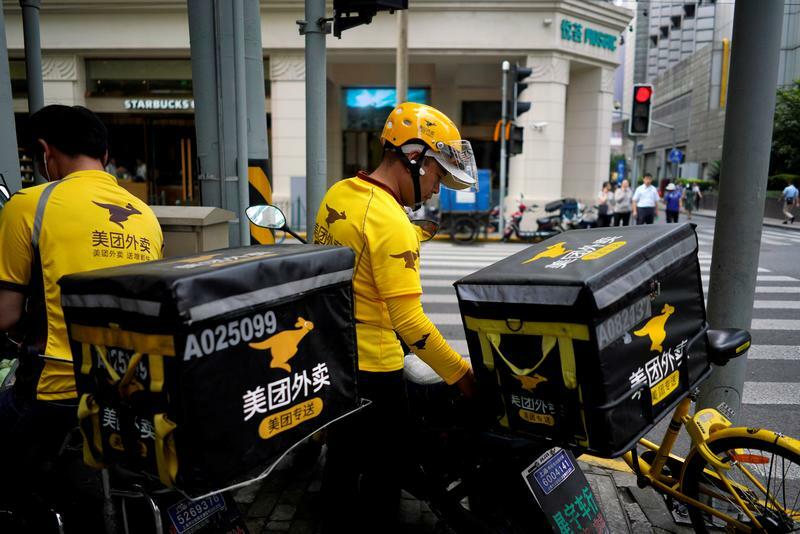 Drivers of food delivery service Meituan are seen in Shanghai, China June 25, 2018. Chinese online-services company Meituan Dianping has set an indicative price range of HK$60 to HK$72 ($7.64-$9.17) a share for its initial public offering in Hong Kong, valuing it at up to $55 billion, Reuters reported on Sept. 1, citing unnamed sources. The company, which is backed by internet giant Tencent, could raise as much as $4 billion before factoring in the sale of any extra shares by underwriters in a so-called overallotment option, according to the report. Meituan Dianping – which offers food delivery, restaurant reservations, ride-hailing and other services through a single app – plans to raise $1.5 billion of the proceeds from five cornerstone investors, including $400 million from Tencent, Reuters reported. The four others are asset manager OppenheimerFunds, UK-based hedge fund Lansdowne Partners, U.S. hedge fund Darsana Master Fund and Chinese state-owned conglomerate China Chengtong. Bank of America Merrill Lynch, Goldman Sachs and Morgan Stanley are sponsors of the IPO. China Renaissance is the financial adviser.